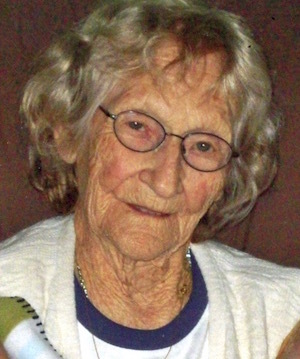 Helen St. Clair, 97, a resident of McLeansboro, Illinois, passed away Sunday, February 10, 2019 at Deaconess Hospital in Evansville, Indiana. She was born November 12, 1921 in McLeansboro, IL to Norman E. and Iva B. (Jenkins) Sidfrids. She married Samuel Richard St. Clair and he preceded her in death. Helen worked in the Housekeeping Department at the Hamilton Memorial Hospital and Nursing Home for several years. She was also a member of the Hopewell Baptist Church. Helen is survived by one son, Sammy Dale St. Clair of Mableton, GA; four daughters: Norma Faye O’Connell of Springfield, IL, Helen Darlene Prior of Kell, IL, Carolyn Sue (husband Bob) Littrell of Holiday, FL and Marilyn Jean French of Kell, IL; special friend, Jim Flannigan of Macedonia, IL; grandchildren: Tommy Joe St. Clair, Jeffrey O’Connell, Kimberly O’Connell, Blanche Parmley, Gregory Prior, Eddie Prior, Derrick Prior, Teresa Ann French, Marion William Edwards Jr., Don Curtis French and Chad Anthony French; great grandchildren: Ashley Kracht, Bobbie Prior, Melanie Buchanan, Celeste Orrill, Tassi Rae Prior, Daniel Ray French, Renee French, Sebastian Edwards, Bryanna French, Alayna French, Carson French, Gregory French, Austin French and Dylan French; great-great grandchildren: Zoe Prior, Bella Crites, Jensen Buchanan, Owen Lee Kracht, Gage Southall, Chase Southall, Wessin Southall, Ashlynn Kinkade, Isaiah French and Arlo French. She was preceded in death by her parents, husband, three sisters: Ruby Callahan, Opal Perry, and Irma Callahan; four grandchildren: Kevin O’Connell, Todd Robert Prior, Tonya Prior and Michelle Prior; and twin great granddaughters, Mackenzy Emma French and Makayla Emily French. Funeral services will be held Sunday, February 17, 2019 at 1:00 p.m. at the Gholson Funeral Home in McLeansboro with Rev. Robert Sefried officiating. Visitation will be held Sunday, February 17 from 11:00 a.m. until the time of service at 1:00 p.m. at the Gholson Funeral Home in McLeansboro. She will be laid to rest at the IOOF Cemetery in McLeansboro.